I left off The Garage, Part I on the turning of the tide – by which I mean the undeniable increase in the degree to which a mood of socio-political dissaffection with Soviet society found its way into the the mainstream culture. This had been growing very slowly, but very surely since the mid-1960s. Traditionally there are two competing dates which are used to signpost the beginnings of this mood – 1965, the year of the Sinyavsky-Daniel trial and 1968, the year of the suppression of the Prague Spring. Take your pick, but ultimately these events, or rather the reaction to these events, represent different stages and different scales of the same process. The mood first started brewing in the ranks of the creative and science intelligentsia, which only constituted a tiny proportion of the population. It did nonetheless spawn a dissident movement, which was fighting a political battle, but created around itself a non-conformist (or at least highly dissatisfied) cultural field which was growing bigger and was becoming more socially inclusive. Even people whose political defiance amounted to their apolitical stand were naturally gravitating towards that field. And by the late 1970’s the casual office chat consisted of the type of comments and remarks for which Sinyavsky and Daniel were put on trial in 1965. The tide had turned: this growing presence and acceptability of socio-political dissatisfaction in the mainstream culminated in the release of The Garage, a strongly disaffected film by the closest thing that the USSR had to a mainstream director. In fact, the controversial – and totally unacceptable even today – sentiment of the quote (“I sold my Motherland for that car!”) which was making waves prior to film’s release was as shocking as it ever got for the audiences, and the quote itself turned out to be an ‘out of context’ joke. But the fact that such a mainstream film contained a genuine critique of the Soviet society, a kind of unforgiving critique that barely left anyone out, and was met by the audiences with a shrug of the shoulders and a “what’s new?” reaction is a hugely telling and fascinating sign in itself. The opening titles of the film introduce its all-star cast with a gallery of images of nationally beloved actors. Ryazanov is one of those directors who chose to work with the same group of people over the years, and I put his success in no small part to this factor as much as anything else. Scriptwriter Emil Braginsky, composer Andrey Petrov, cinematographer Vladimir Nakhabtsev, and a big group of actors, most of whom achieved success through previous Ryazanov’s films, are all part of The Garage. The story has that perfect dramatic structure – a simple narrative set up on the outside that allows for an array of complexities on the inside – of which Sidney Lumet’s 12 Angry Men is a fine fine example. A group of people are forced to remain spatially enclosed until they come to some sort of resolution of a problem at hand, and after they do none of them will remain the same. The group in our case is a cooperative: a small organisation put together by the members of a research institute in order to push through the overwhelming bureaucracy of the Soviet system to set up a garage site in the middle of a city. It is clear that this project has been in existence for some time, as you wouldn’t expect things like this to be resolved swiftly. The cooperative has its own hierarchichal and bureaucratic structure, and is headed by an almighty group of institute’s big shots. In short, the cooperative is a little model of a society which seems to be plagued by the problems that would be all too familiar to the Soviet audiences. To push the symbolism even further Ryazanov makes animal kingdom the subject of institute’s research (hence the official name of the cooperative is ‘Fauna’ – see what they did there?) and sets the meeting in the space of a natural history museum part of the institute, surrounding his characters with figures of taxidermied animals. A regular and an unbearably tedious meeting, attendance clearly required, takes an unexpected turn when it is announced that the city council will be building a road that will cut through the garage site. This means that four people out of the cooperative will have to be left without a garage for their beloved cars, and the question is: who will it be? The mayhem that ensues reveals all sorts of unpleasant truths about human nature in general and this society in particular. The chairmen of the cooperative announce a list of names that they suggest for a removal, and in accordance with a standard procedure invite voting on it. But, as one of the characters puts it, “voting against our chairmen is like spitting against the wind”. At first the people on the list attempt to stand up for themselves individually. And it is at this point that one of the characters announces his betrayal of his Motherland in return for a car, causing a very long and a very awkward silence and a general exodus from the seats near him. As it turns out, his ‘Motherland’ is not Russia or the USSR, but a small piece of land and the house where he was born, which he sold in order to purchase an automobile. Other ‘victims’ of the big decision include an old man; an absent researcher who is represented by his very highly strung and clearly long-suffering wife; and a man who has, oh so symbolically, lost his voice and now defends himself by waving his hands and stomping his feet. Eventually the sporadic actions of these individuals turn into a more coordinated protest and revolt (somebody locks the door and hides the key so nobody can get out) and the rest of the cooperative splits into two opposing camps which fight it out for the rest of the film. The ‘fighting’ techniques range from debates on morality and how things should be run in a real democracy to very personal attacks on each other, using dirty gossip and professional disagreements. The romantic storyline of the film includes two young people who happen to sit next to each other at the meeting. They exchange rather cynical remarks at the beginning, but as the night and the film progresses they let their guards down. “What do you do?” he asks her. “I study satire” she answers (not all of the members of the cooperative are the animal research institute workers).”Contemporary Russian satire”. To which his reply is “You’ve got an interesting job. You study something that doesn’t exist”. She smiles with a suggestion that he has won her heart. Another typical joke comes out of an exchange of unpleasantries between the characters on the subject of their scientific research. One of them attacks the worthlessness of studying the silver crane (it might not be a real bird), because it does not nest in Russia and therefore is not “our” bird. To which reply comes: “the silver crane is an uneducated bird and doesn’t read the newspapers. Therefore it does not know whether it is “our” bird or a capitalist one”. 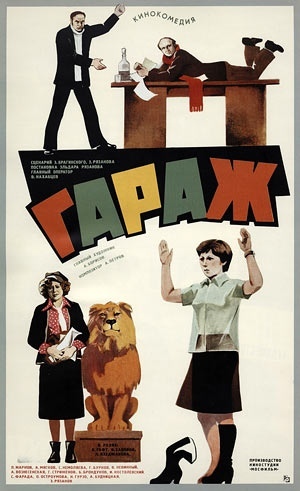 Every character in this film represents a particular part of Soviet society (although I wouldn’t want to suggest that this representation is comprehensive, as all of them are urban dwellers, for instance), and the dialogue expresses each of their views and social positions in various subtle and not-so-subtle ways. A lot of these archetypes are still recognisable to modern Russian audiences. As the film progresses we, the viewers, get involved in the debates and start identifying with particular characters while resenting others, as undoubtedly did the audiences in 1979. However the biggest blow of the film and the ultimate expression of cynicism lies in the deliberate disproportion between the passionate actions of the characters and the stakes at hand (garages!). As we get carried away with the debates and the actions of the characters, listening to their passionate speeches and emotional confessions, projecting our own views and moral standpoint, whilst rooting for one side or another, the mere reminder of what they are fighting for brings us down to earth and the bitter taste of disappointment and hopelessness is difficult to shake off. In The Garage, Ryazanov, the ultimate kind and loving storyteller, the provider of escapism for apolitical Soviet citizens, does not leave the viewer anything to cling on to in the final analysis. And the fact that audiences took such harsh realism for granted, whilst the censors did nothing to prevent the release of the film, is the most revealing part of the whole thing. The social discontent, as well as the ability and desire to think about the world and the self critically, had become part of the Soviet cultural mainstream by 1979. And I hope this fact can shine a new light on the understanding and perception of the late Soviet empire and social forces within it, as well as Russia’s subseqent history. Despite the prevailing cynical mood of the film the political message at the end is loud and clear: Don’t sleep!